Music | Pish Posh Etc. This reminded me of last month when Jackson Browne got angry at the GOP for using his Running On Empty during his campaign. Since I don’t listen to XPN much anymore since I got my iPod, now I actually have to do my own poking around to discover new artists I might like and sometimes it takes me awhile to discover one that’s been out awhile. This morning, as part of my normal morning online routine, I went to see what Amazon’s Mp3 Store had as their deeply discounted album. I admit that usually if it’s something I’ve never heard of, I don’t really take time to look at it unless I have the time to really check it out. Well, I’m kinda glad I did take the time this morning. Today they have the self-titled album by The Bird and the Bee available for $1.99. I went to listen to a sample of a few songs and fell in love with them! One of my more recent newish music obsessions has been The Weepies and The Bird and the Bee definitely has a bit of a Weepies sound, so if you’re into that folksy, sweet kinda sound, take a listen. 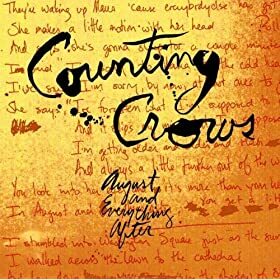 I’ve already owned August & Everything After by the Counting Crows for about 15 years now and was happy to see Amazon.com’s mp3 Store offering it on special for $2.99 today. I hope that the sale will invite some younger folks or folks that never got around to buying the album to get it. August & Everything After has been one of my favorite albums since it came out and I still listen to it on a regular basis (even if it’s through my iPod or iTunes now). Every track has its own special sound and wonderfully crafted lyrics and storytelling by Adam Duritz. We probably all remember the big hit off this album, Mr. Jones, and the video of Adam dancing around in the bar. And actually, my favorite track off the album (if I had to choose a favorite) has always been Round Here. Such a very great, brooding kinda song, really, but I love everything about it and it’s one that I’ve been known to play over and over in a loop to comfort me. Of course I love all the tracks and they segue so well from one to the other. Hopefully August & Everything After will continue to live on as a classic album. So unlimited stars for Adam Duritz & Co and I’ll probably turn it on at some point tonight. And of course I’m leaving with two videos of songs from August…Round Here and Omaha. and I’m throwing in Mr. Jones just for fun. If you are a music/mp3 lover, run over to the Amazon.com’s mp3 Store. One of my daily online habits has been to check their mp3 Daily Deal. They aren’t always wonderful albums, but I’ve gotten so many albums I’ve wanted, but haven’t gotten, for fantastic prices. This week I got three: Depeche Mode’s double greatest hits album ($3.99), Prince’s 1999 album ($1.99) and today Jenny Lewis & The Watson Twins’ Rabbit Fur Coat ($2.99). So, thanks to their great prices I can feed my music habit for a reasonable cost. And they have a nice gaggle of free downloads on Tuesdays and often they’re great artists. And on Fridays they put up 5 albums for $5 and they’re always classic ones too. Amazon.com’s mp3 store is so great compared to iTunes…since I found Amazon.com’s mp3 store I’ve barely bought anything from iTunes. So, three cheers, again, for Amazon! In case you missed this story yesterday, Jackson Browne sues over McCain ad. The singer-songwriter Jackson Browne has filed suit against Senator John McCain, the presumptive Republican nominee, over what he says is the unauthorized use of his 1977 hit “Running on Empty” in a McCain campaign commercial shown in Ohio, Mr. Browne’s lawyer said Thursday. The suit, filed in Federal District Court in Los Angeles, seeks unspecified damages as well as an injunction against the use of the song in the commercial, which criticizes Senator Barack Obama, the presumptive Democratic nominee, for saying that Americans could conserve gasoline by keeping car tires at the proper pressure. This whole story made me laugh and it’s great that Jackson is sticking it to McCain. It sounds like there’s some confusion on who produced the initial ad, but I think Jackson should continue his fight. Seriously, how dare McCain’s friends use Jackson Browne’s song like that? Another little memorial blog, now for Mr. Isaac Hayes, who passed away today. You can find a nice overview of his life on Wikipedia or on his own website. I have about 13,000 songs on my iPod and usually people are shocked to hear that, but I really love my music and listen to pretty much everything. I am probably what you would call a music geek. So, occasionally a certain song will come up and my mind will automatically flashback to the time when the song meant a whole lot to me or was the soundtrack to whatever was going on in my life. Today that song was Here and Now by Letters to Cleo. This wasn’t super popular, but reminds me of my high school years and just the whole atmosphere that was my life in the early 90s. These days I wish I had those problems I had then…back then I thought my petty little issues were going to be the end of my world, but now I’d love it if my only problems were how to get a certain guy friend to see me as more than that and wondering if I’d find a place to fit in. Anyway, today when this song came on I played it at least 3 times…it takes me right back to that place since, as I recall, I played it over and over when I was that age. I did find a video of it on YouTube. I love YouTube for having so many quirky videos like this easily available. Today I finally got around to watching High Fidelity all the way through. I generally like John Cusak and dig his characters. He played the brooding, introspective Rob here that recalls all his past relationships and wonders where everything went wrong. I really wasn’t wild about the character of Laura, who he ended up getting into this spiral over, but I enjoyed following the story of him getting to this point. I especially loved the record store Rob owned and he and his friends’ obsession talking about music and talking so geekily about different artists. Jack Black gave a great performance, playing a wacky character he’s generally good at playing. The general soundtrack to the film went along well with the whole story. I am having a little insomnia tonight. I’ve finished all my “fun” stuff I have to do online and really don’t feel like watching TV so I’m looking for music to download. From Limewire of course. There are a few sites I frequent to help lead me good music because, honestly, not everything is on iTunes and I like being able to find weird and unique music, often music that no one in my age group really listens to. My favorite site is Digital Dreamdoor Music Lists. I appreciate that the owner has included all kinds of genres…surf music, blues, doo wop, etc. Not just the plain ol’ country, rap and pop. I like that in his 90s lists I have found songs I haven’t thought of in *years*. Some of the 80s tunes bring me back, but the 90s were all on during my turbulent adolescent years and I have a real warm spot for those tunes…even ones that I hated at the time. I guess it’s all just nostalgia now. I have also gotten into Pandora. The lists aren’t there, but I like that they can help me find music like R.E.M. (though there’s NO ONE like R.E.M.). So all this should help me doze.